I’ve been writing a lot about whisky lately and right now my office is scattered with 30ml miniature bottles of golden booze. Lots of Scottish whisky, Japanese whisky and all kinds of American bourbons and ryes, along with miniatures from more unlikely countries such as France and South Africa. I’m pretty good at avoiding the temptation to sip my way through them while working during the day, although the current cold snap is pushing that temptation to the limit. As I write it’s approaching 5pm and the heater under my desk is failing to fight off the chill, so I’m shivering. I reckon right now is a perfectly acceptable time to twist off a whisky bottle seal and take a warming swig, so I’m diving in to a dram that I’ve previously overlooked to consider how it shapes up against the global gathering of spirits around me. The Wolfburn Distillery is located in Thurso, the most northerly town on British mainland. The current distillery began life in 2012, but Wolfburn whisky first emerged from the same site in 1821 and kept going for around 20 to 30 years before closing down. After 150 years the first new whisky was released in 2016, reviving Wolfburn and putting to good use the local supply of natural water from where it gets its name (‘burn’ means ‘stream’ or ‘small river’). Aurora is a single malt whisky created from a combination of bourbon and sherry casks and is the first of the distillery’s output that I’m getting my chops around. Of the small clutch of bottles that Wolfburn Aurora sits among, it is by far the lightest. A bright straw colour that would probably twinkle beautifully in the sunlight if the sunlight ever managed to enter my office on a grey winter day. On the nose the straw freshens, becoming meadow-like and there’s lots of sweet sherry too: it smells clean, light and immediately approachable. That sherry sweetness has a sticky honey coating to it and is the first thing that hits the palate. With a 46%, young looking whisky that has some bourbon cask ageing behind it, I might’ve expected more of an immediate hit of alcohol, and maybe even some rough edges, but the sweetness neatly smooths everything out so when the nuttier, spicier flavours do come through they’re perfectly balanced with the overall lightness of the whisky. Vanilla flavours are evident throughout, marrying well with the upfront sweetness, accentuating some almond notes in the middle and drying out a touch at the finish to lend the whisky warmth I was looking for. As a 5pm whisky, Aurora has hit the spot: it’s delicate, easy to drink, sweetly delicious and gently warming. 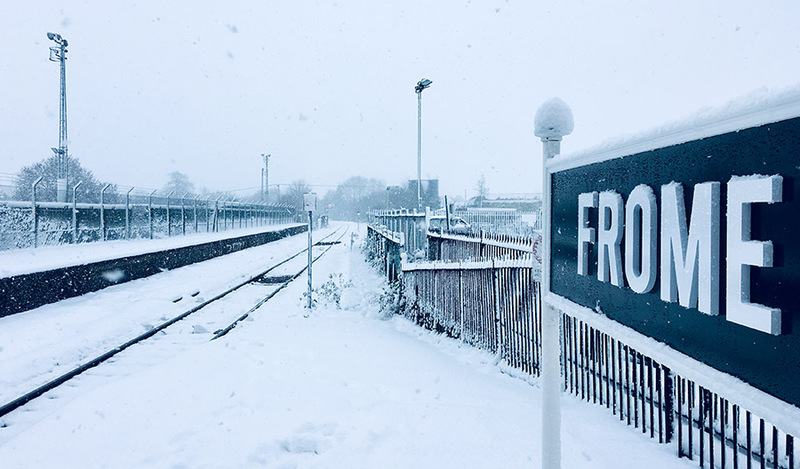 The heavier hitting whisky miniatures will be steadily consumed in front of the fire during cold evenings but the half-dram-bottle of Aurora I’m left with stays on the office desk – I’m sure it will come in handy the next time the heater fails to do its job. The post Wolfburn Aurora: a delicate, warming whisky for a 5pm chill appeared first on Two Thirsty Gardeners. This January I’ve been having a few weeks without alcohol. Not the full Dry January but limiting booze to just a couple of days all month to make up for December’s excesses. At the top of my list of boozeless beverages is the Shrub: a fruity cocktail made from vinegar syrup and soda. To the uninitiated, drinking vinegar might sound strange, but although it’s very diluted it provides enough of an acidic snap to jolt you into life in much the same way as alcohol does. 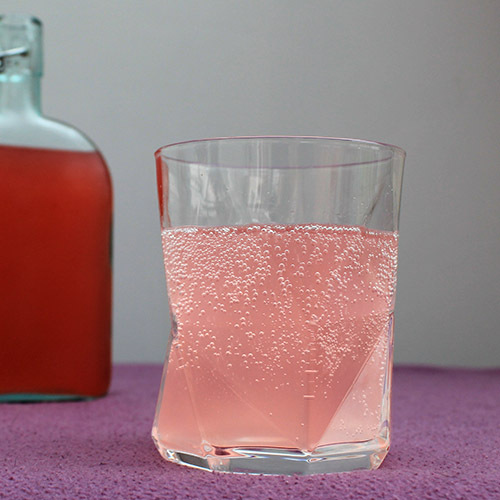 To make a Shrub you first need to make the vinegar syrup, which acts as a concentrate (much like a bottle of squash concentrate) to be diluted with soda water. 1 First up, I sterilised a glass preserving jar. Vinegar should see off most bacteria but it’s still worth keeping your storage vessel sterilised for other nasties that vinegar might be less fearful of its acidic vengeance. To do this I washed the container in hot, soapy water then dried it in the oven on a low heat for 20 minutes – this also means the jar is hot when it’s time to add the hot vinegar, which will prevent the glass from cracking. 2 While the jar is in the oven put the cider vinegar in a pan and heat until it just reaches boiling point. Tip in the sugar and stir to dissolve before adding chopped rhubarb and ginger diced into tiny pieces. 3 Pour everything into the sterilised jar, seal the lid and set aside. I left mine for four days which seemed long enough to get most of the flavour from the ingredients and allow them to start mellowing with the cider vinegar. 4 Strain the vinegary liquid into a sterilised bottle, gently squeezing out the goodness, and store in the fridge. * It’s probably best to use it within a couple of weeks. **Although the syrup would probably work well in a few alcohol-based cocktails too. Suggestions please. 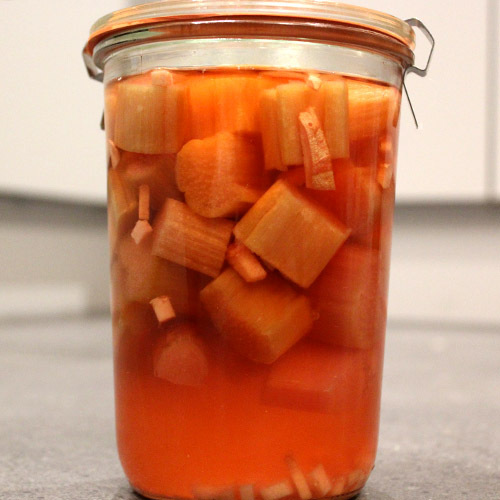 The post How to make a rhubarb and ginger shrub: an easy alcohol-free cocktail recipe appeared first on Two Thirsty Gardeners. Last year we had a Hayter Osprey 46 Autodrive Mower on a long term test and spent the summer months beasting grass on a variety of lawns. With its tour of duty now over, it currently lies dormant at the back of our brewing shed, enjoying a well earned winter rest between a broken cider press and a crate of Nick’s quarantined pea pod wine. Here’s our thoughts from a summer of use. The Hayter Osprey 46 arrived in a MASSIVE box that unfortunately had no handle holes to aid in its transportation. Cursing the uncooperative cardboard, I just about managed to manoeuvre the weighty package into an area I had earmarked for disembarkment without enraging my old hernia operation. Ideally you’ll want want to enlist help from a strong pal* for this task. On opening, the box revealed a packing masterclass, with every mower part carefully packed and wrapped and all potential finger slicing edges thoroughly sheathed. In most situations where self assembly is required, I tend to bypass the instructions and wade straight in and gues-emble the product in question, then get cross when nothing fits or works. In an unexpected change of habit, I decided on actually reading the instructions. Good job I did – the instructions pull no punches, stating that there is a strong chance of losing a limb if you don’t follow the safety advice. Thoroughly forewarned, I tentatively began to assemble the mower, counting and recounting my vulnerable digits as I went. As it turned out, assembly from the box was a straightforward affair, with just the simple task of fitting the handle using the bolts provided. All good. Petrol-heads will appreciate the throaty rasp you can coax from the Briggs & Stratton 500 series engine. Pump the accelerator bar! Hear it roar! Clasp the auto drive bar and the Osprey will lurch forward like one of Nick’s recalcitrant greyhounds, straining on its leash on a post breakfast / pre-poo walk. The advantages of the auto drive are subtle when mowing a level lawn, but take your hand off the assist bar – especially when mowing on an incline – and you’ll soon notice the benefits. The auto assist also comes in handy when manoeuvring the mower in awkward spaces. With a bit of practice a few gentle tweaks on the bar can help turn the mower in tight circles when you need to. Most of our testing was conducted on long-ish, damp grass, which, in some mowers, can cause clogging, especially in the channel where the grass passes from mower to grass box. The Osprey did clog on one of the earlier test runs, but we forgivingly put this down to a particularly dense patch of moss we had just ploughed through. The grass box itself has good capacity. As a guide, a full load of grass, when emptied, will half fill a standard bin bag. The Osprey folds down neatly. The handle can be folded in two and doubles over itself with a few twists on the handle knobs, whilst the semi-rigid grass box is an added space-saving bonus. Before bedding down your mower for the night, it’s always wise to give it a good clean. 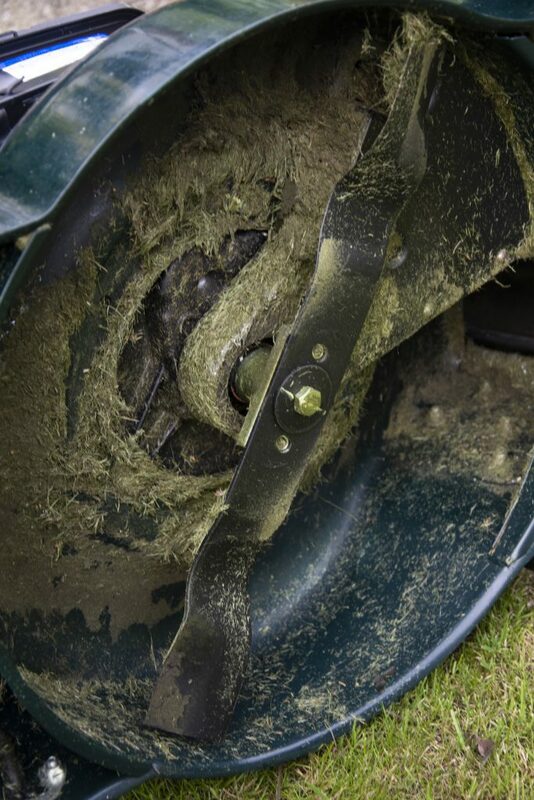 Understandably, the undersides of mowers get particularly filthy, and if left unattended, wet grass detritus can prove to be particularly bothersome to shift. 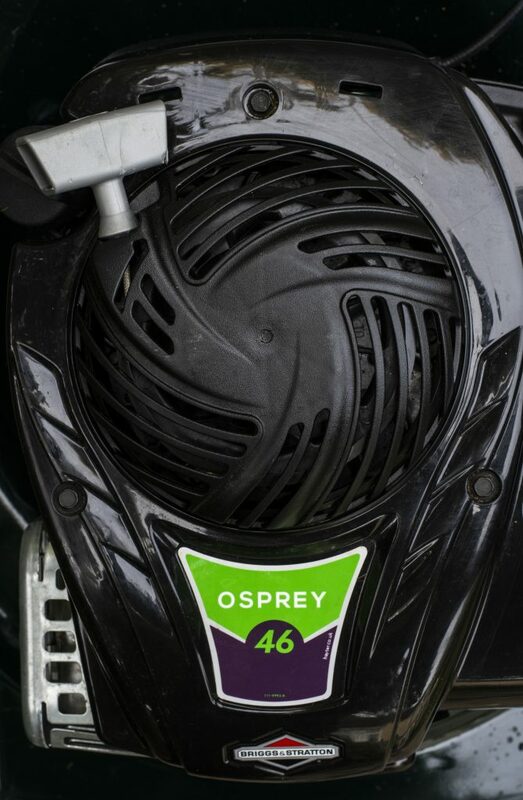 The Osprey has this covered, and comes equipped with a wash port. Attach a hose to the built in nozzle, turn on the tap and then turn on the engine. Whilst this helps shift the caked clippings, it doesn’t do an immaculate job (we’d advise giving it a couple of runs through, with a bit of scrubbing in between) but certainly makes the cleanup process less painful. Oh, and make sure the mower is dry before storage. 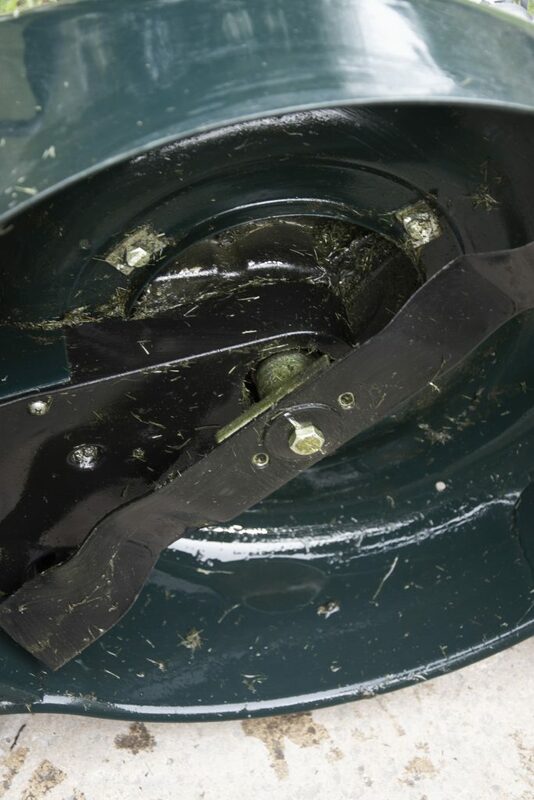 Steel mowers are rust magnets, especially around the wheel axles and areas chipped by flying stones. Run the engine for a few minutes after washing, and this will dry out the machine nicely. The Osprey 46 Autodrive Lawnmower is a compact, punchy petrol mower, perfect for tackling a medium to large sized garden. The auto assist is a welcome addition, effective without feeling like you have handed over control. It’s a mower that actually managed to make mowing an enjoyable experience, which is no mean feat. *None of my strong friends were available at the time of mower delivery. And Nick was also busy. ** The fear of knacking my back when hoisting heavy weights such as this has led me to purchase a weightlifters belt. It’s not exactly stylish, but does the job. Lift with the legs! Keep the back straight! The post Hayter Osprey 46 Autodrive Lawnmower Review appeared first on Two Thirsty Gardeners. Here’s our latest round up of the new booze (and snacks) that have passed our lips in recent weeks, including some of our drinking highlights from the festive season. We reckon there’s a bit of a marketing spend behind Braybrooke’s Keller Lager. The Leicestershire brewery has a formidable PR company supporting it who sent us a brace of bottles that was accompanied by a smart little brochure – not many individual beers get their own brochures. Thankfully for the PR company the product is a decent one: nice sweet bready malts and a gentle Germanic bitterness. Simple, tasty and effective it had Rich purring with satisfaction. As the spirit market becomes ever more competitive, big brands are looking for innovative ways to thrust their products into the limelight. One such method that we’ve noticed gaining in popularity is the use of limited edition packages (the same product presented in a different bottle). Big bourbon brand Bulleit is the latest to get creative with glass and they sent us a bottle designed by New York tattoo artist Jess Mascetti. We quite like the results – it’s an impressive piece of inkwork and genuinely makes the bottle feel a bit special, especially when you peer through the golden booze to view it on the reverse. As for the bourbon, it’s made with quite a lot of rye which gives it plenty of punchy spice among the oaky vanilla flavours and is one we like to use for cocktails, being especially effective in a Manhattan. This item may not actually feature booze, but it’s such a good idea for the stay-at-home drinker that we thought it deserved inclusion. 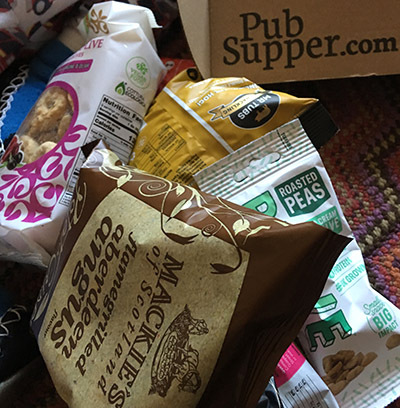 The concept is simple: a subscription club that sends out a box of nine pub inspired snacks on a monthly basis. The munchables in our sample were all top notch and included posh crisps (haggis flavour! ), pork crackling, roasted peas and a weighty bag of Italian onion and olive savoury biscuity things (we’ve not been to an Italian pub, but we like their style). At just £15 we think this is a beer-enhancing bargain. The festive season always acts as a good excuse to try out new boozes and here’s a selection of what we guzzled this Christmas. We both stocked up on Fuller’s 2018 Vintage Ale (10.5%): a strong brew that was smooth as polished marble with creamy alcohol peppered by tannic dark fruit skins, a bit of mellow citrus and a dry oaky finish. Lovely stuff. Edinburgh Beer Factory showered us with several beers which we shared with friends – of those we kept for ourselves Edinburgh Brown (6%) was the highlight with a rootsy bitterness cutting through the clean, fresh and frothy malty liquid. Rich enjoyed a few tankards of keeved cider in the shape of Champagne-corked bottles from Pilton Cider whose medium sweet Tamoshanta (4.7%) greatly impressed. Nick finished his festive boozing with a dram of Campbeltown PBS whisky bottled by Cadenhead’s at a barrel strength 57.1%, a delicious drop with honeyed almonds flavours and a gentle waft of oaky smoke. 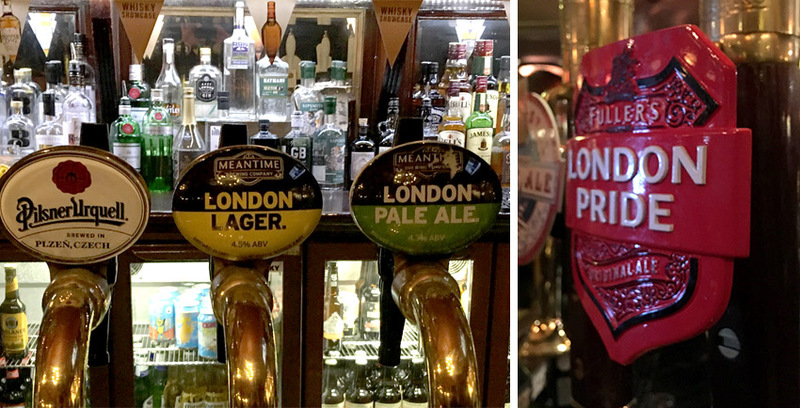 The post New booze round-up #2: featuring keller lager, crackling and tattoos appeared first on Two Thirsty Gardeners. It’s usually not until you try something new that you realise how rubbish the old has become. I’ve been using the same pruners for years. Over time they’ve gotten a little stiff, have started to sport a rusty fringe and prefer to bludgeon their way through thicker branches rather than cut, but they’ve always just about done the job so I’ve never considered replacing them. Towards the end of last year Dutch retailers Knives and Tools sent me a pair of Japanese Okatsune Pruning Shears to review and they’re so impressive that the old tool has now been banished from the garden. Pruning fruiting plants is one of the first gardening jobs I undertake in a new year, so this provided an ideal opportunity to test the cut and thrust of this Japanese piece of craftsmanship. There were three key jobs to undertake. My apple trees are now established so don’t need the the same level of hacking back as in their first few years, but there were a few branches that had crossed and needed to be removed, along with some additional snips to maintain shapeliness. The casseille (a blackcurrant / gooseberry cross) and Big Ben blackcurrants needed more serious attention – they’ve been getting a bit out of control, not helped by being clumsily bent over during a fence installation, pushing most of their branches out to a horizontal direction. Besides removing old wood (currants grow best on the most recent growth) they also needed further thinning so the remaining growth had a vertical inclination. 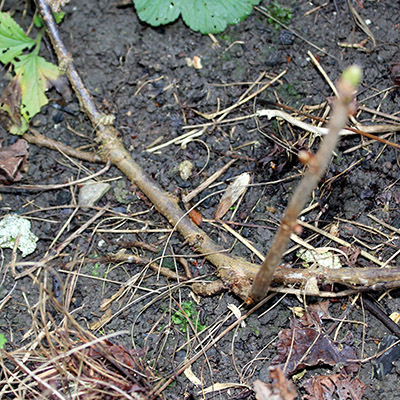 There were also a few Autumn fruiting raspberry canes to cut back to the ground. I like the look of Okatsune’s pruners. They’re not flash and they don’t have weird design features that claim unusual ergonomics: they are simply a product of their functionality. I assumed the only nod to any type of aesthetic was the fancy red and white colours of the sleek, curved handles – a nod to their Japanese origin perhaps – but Rich informs me that even these are borne of function. Apparently the colour choice is to help locate them should careless cutting cause them to tumble into the undergrowth: red for daytime, white for low levels of light. Between the handles is one of the major assets of the pruners: a tight, powerful spring that assists with the ease of the squeeze while keeping the blades running in smooth, flexible order. Those blades are forged from tough Japanese carbon steel (which is also used to make katana swords) and are hard and sharp, which should mean they stay fit for purpose for a far greater length of time than my old pruners. The cuts to every branch I tackled were managed with swift precision, and were each perfectly clean (which those plants will be extremely grateful for). The recommended upper diameter for cutting is 20mm and, although I didn’t measure what girths I overcame, the pruner managed every thickness presented to its steely blades (including a few apple branches that would’ve been too much of a burden for my old tool). I’ve always quite liked the job of pruning and, having raced around the fruit in no time, started eyeing up more of the garden that might benefit from a trim. But apart from dealing with an unruly bay tree branch I resisted the urge to get carried away and gave the pruners a quick clean before putting them away for next time. A pair of pruners should be a tool that lasts a very long time, so it’s worth considering getting the best you can afford and are comfortable with. 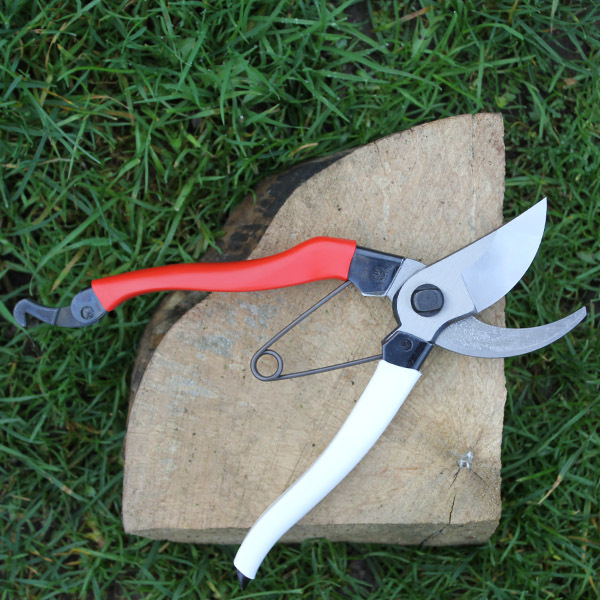 If, like me, you prefer the utilitarian approach married with ultimate functionality then I can highly recommend Okatsune’s Pruning Shears – I reckon it’ll be decades before something new makes this tool feel old and unwanted. During fence installation my casseille was bent over to such a degree (and probably trodden on) that a branch tracked along the soil and has rooted. This has now been snipped from the main plant and will be transplanted to Rich’s allotment for a new free fruit bush. 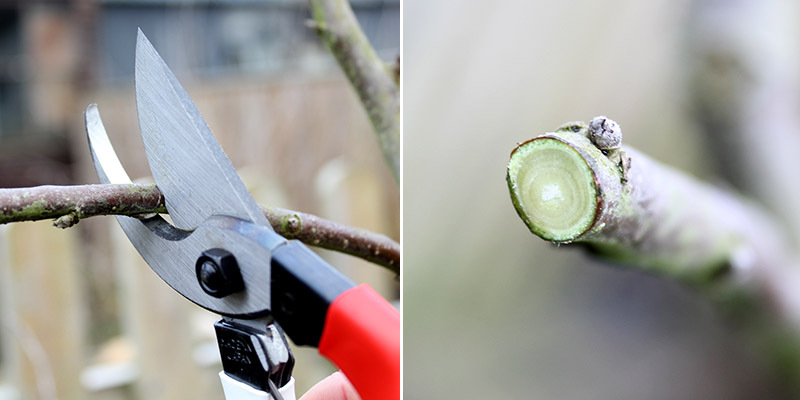 The post Winter fruit pruning with Okatsune Pruning Shears appeared first on Two Thirsty Gardeners. You can’t fail to have noticed that a lot of new booze is being released at the moment. Not only are craft producers are springing up all over the shop but established brands are also getting in on the act with shelf-loads of adventurous new product ranges. Besides eagerly seeking out new boozes in pubs, supermarkets and online we also get sent more than our fair share of drink samples from businesses and PR companies eager to hear our feedback on their products (and hoping we’ll give them a mention in the press). Until now we’ve not done much with these drinks, other than tweet any that particularly impress or intrigue, but we think the time is right to give the best of them some coverage on our blog. So here’s the first of an irregular series of ‘new booze round-ups’, covering the best of the booze that we’ve been sent or stumbled across. In November, Nick headed down to Cornwall to spend an evening at St Austell Brewery’s annual beer festival. Along with their regular beers, and a selection from other Cornish and national breweries, were a load of one-off specials brewed by various members of the St Austell and Bath Ales (owned by St Austell) brewing teams. Inspired by Cornwall’s wintery, stormy skies, Nick’s pick of the beers was a pair of dark brooding brews. Bath Ales ‘Honey I Shrunk The Porter’ (5%) was a delicious honey porter with a heady aroma of coconut rum, lots of sweet toasty malt flavours and a warming booziness, while St Austell’s annual release of its barrel aged Black Square Russian Imperial Stout (10.4%) was even better: slick and creamy with mellow fruitiness, bitter chocolate and a rich vibrancy from its barrel ageing. The best beer to arrive through the post came from the good folk at Borough Market who worked with brewer Daniel Tapper of The Beak Brewery to create a 5.2% saison made with Earl Grey tea (provided by trader Organic Life) and hops grown at the front of the market hall. We like Earl Grey as an adjunct – it’s a tea that’s flavoured with Bergamot which has floral orange flavours that aren’t a million miles from some hops while the tea’s tannin gives beers an extra dryness at the finish. This saison suited the Earl Grey addition exceptionally well: an amazingly fresh and spritzy beer with those tea characteristics perfectly well balanced with the clean and punchy malt, yeast and hop flavours. We were also introduced to Surrey outfit Crafty Brewing in the form of a three pack featuring their Five Hop IPA, Pale Ale and the brilliantly named Loxhill Biscuit (3.8%). It’s a golden sweet and light biscuity brew with subtle orangey citrus flavours from Amarillo hops (it also includes First Gold and Challenger) that perk up through the moderately bitter finish: one to file in the ‘easy drinking’ category. Our most recent commissions for the i paper included round-ups of gin (Rich) and bourbon (Nick). Among Rich’s selection was a quince gin from distillers Whitley Neill which features the flavours of the under-appreciated Persian fruit with earthy and piney bitter notes of juniper and spice. Rich thought it had a not-too-sweet zestiness and recommended skipping the tonic and drinking neat, pairing it with cheese over the festive period. Among Nick’s bourbons was an organic spirit from Koval, a Chicago distillery making inroads into the UK market. Along with the bourbon he also got hold of a bottle of their whiskey made from 100% millet, an incredibly smooth and creamy spirit with quite a noticeable aroma and flavour of pears mingling with the soft grains. The post New booze round-up #1: featuring Earl Grey, Millet and Quince appeared first on Two Thirsty Gardeners. Let the bells ring out! It’s our digging and swigging Christmas Gift Guide 2019! For the past few months we’ve been keeping our eyes out for booze and gardening gifts that we think might please YOU, our beloved reader(s). Here’s a collection of fine digging and swigging suggestions to inform your hasty, last minute purchases, each one a GUARANTEED sure-fire winner. Just make sure you keep checking this page as we’ll be updating it with more suggestions as Christmas looms upon us. Every year a there are new beers subscription services added to an already busy market place and we do our best to test them all. Among the most recent launches that has impressed is Beer Me Now, a regular service that provides a good mix of popular classic beers with less well known bottles and cans (along with a salty snack for munching action). 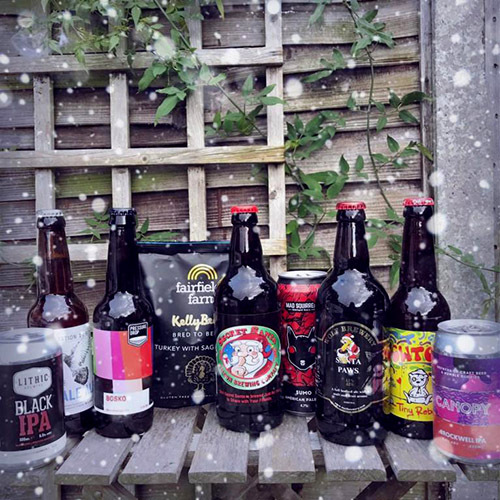 The Beer Me Now team has also put together a one off box of goodies just for Christmas, so you or a mate can enjoy their selection of eight ace beers as a one-off purchase (which we reckon might be enough to tempt you to signing up when all the Christmas beers have gone). If you’re hunting for a gift for a whisky fan but are not quite sure what they like then might we suggest this handsomely boxed bottle. It’s a classic Speyside whisky (everyone likes a classic Speyside) from one of the most popular Scottish distilleries, the Glenlivet. 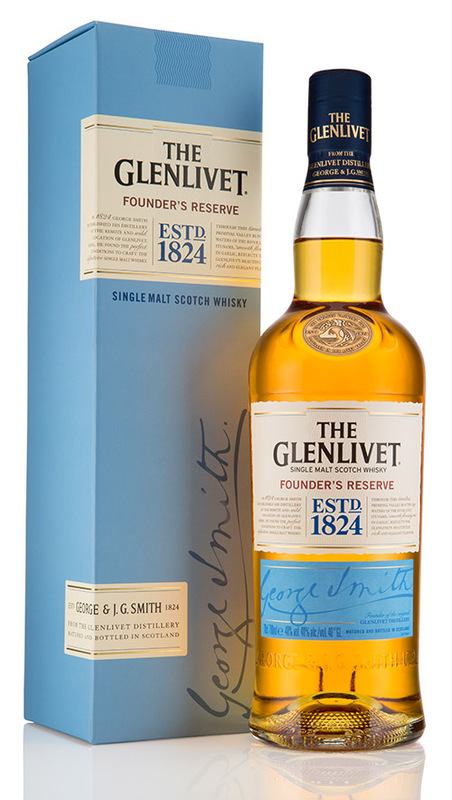 The whisky is named in honour of Glenlivet’s founder and is a smooth sipping delight, with some clean tasting floral and fruity notes and not a rough edge to be found. Perfect to ease away any Christmas chaos. 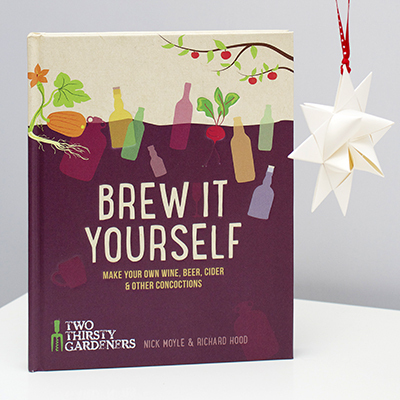 For the ultimate digging and swigging gift there’s always our book, Brew it Yourself. It’s rammed full with ace booze recipes – from beers, ciders and wines to more curious cocktails and infusions, and a few Christmassy boozes to boot – many of them using home grown ingredients. And don’t just take our word for its goodness – take a look at the five star reviews on Amazon for authentic tales of boozy glee. And whilst we’re on an undignified, egotistic roll of self promotion, allow us to recommend this splendid apple poster, designed by Nick’s very own gnarled mouse-hand. 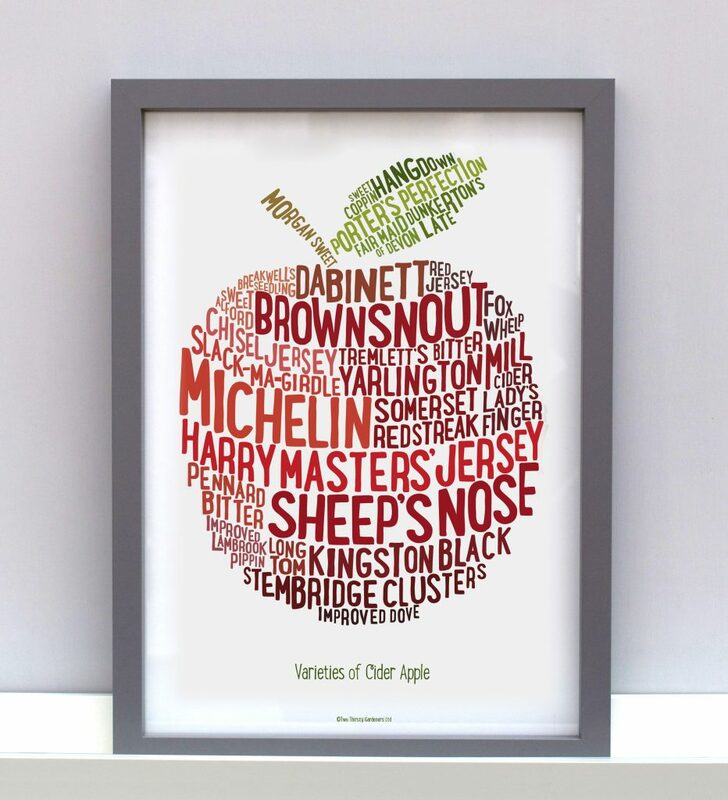 It’s a typographic apple, beautifully constructed using the names of Somerset cider varieties. Ideal for bathrooms, sheds, kitchens and outhouses and just the ticket for covering up unsightly stains on walls. It costs a mere £10 (including postage) and you can buy it from our Etsy shop, right HERE. 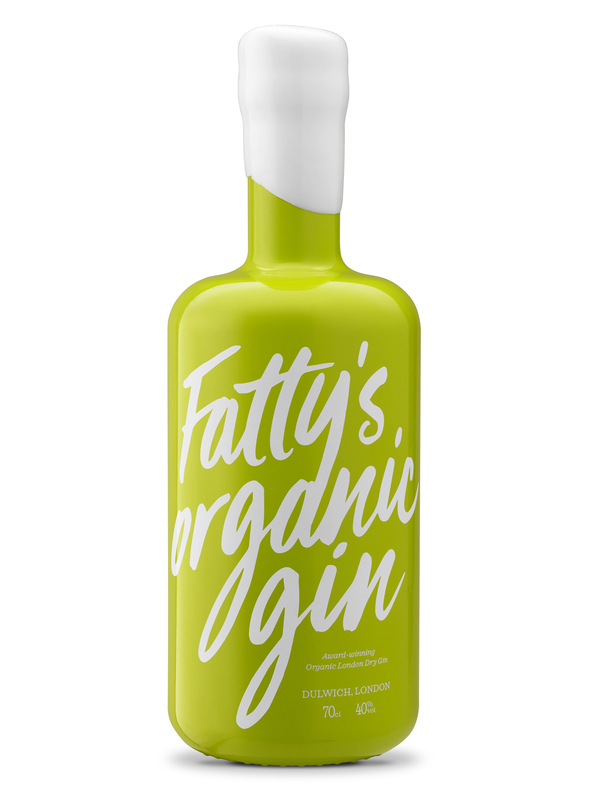 Looking for a new groovy gin to gift (or guzzle)? Look no further – this Dulwich-born gin has been distilled with dill, the fish-loving, feathery-fronded herb. It’s a London Dry style with delicate herbal notes and was deemed tasty enough to grab gold at the 2018 Spirits Business Awards.As Claudio Ranieri would say: “dilly-ding, dilly-dong” (whatever the hell that means). 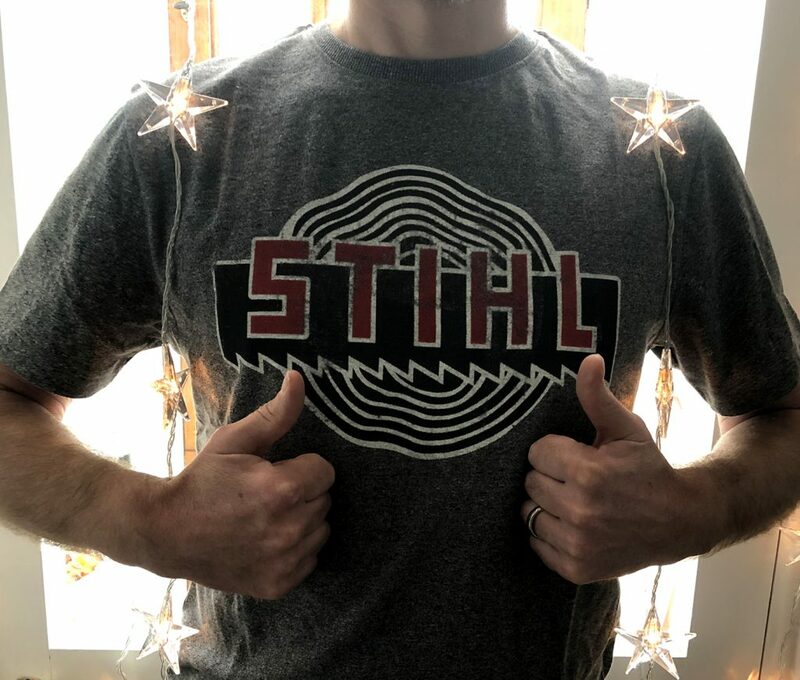 Clad your beloved in one of these retro T-shirt from Stihl, our favourite German power tool peddler. Made from mottled grey cloth and sporting a groovy circular saw logo, it’ll cut a dash down both allotment and pub. We can confirm that the ‘medium’ will happily fit a short, bald, mis-shaped man pushing 50 years of age. Ja! Danke! Deck the halls with boozy baubles, tra la la la la, la la la la. 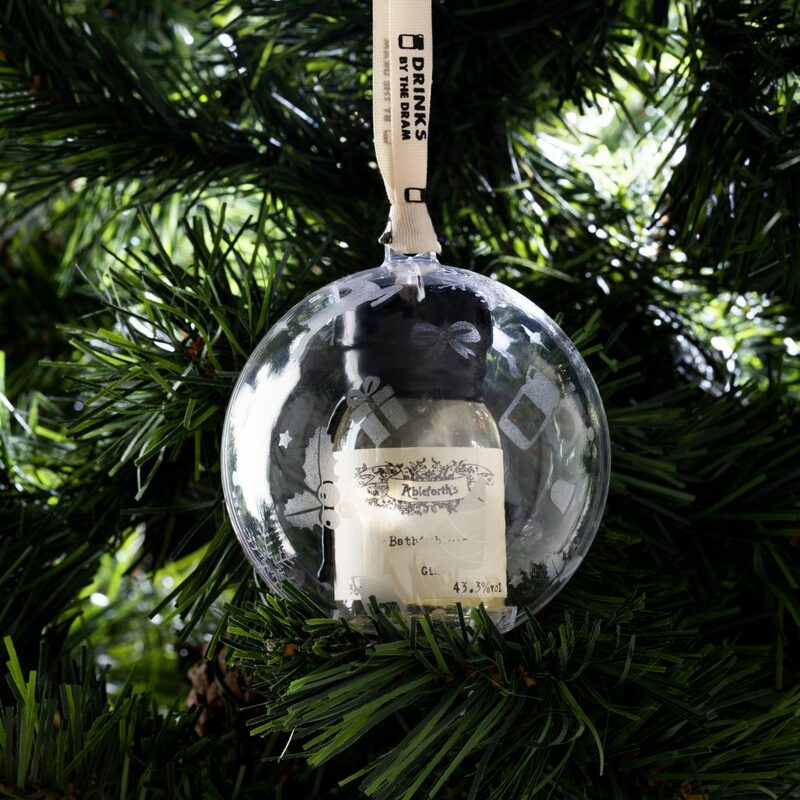 Each bauble contains a wax-sealed 30ml dram, filled with an exceptional expression. Hang them, admire them, drink them and embrace the festive spirit(s). Also available in whisky. The post Let the bells ring out! It’s our digging and swigging Christmas Gift Guide 2019! appeared first on Two Thirsty Gardeners. A lot can happen in a quarter of a century. 25 years ago, in 1993, England failed to qualify for the World Cup in the USA, Mr Blobby spent a few weeks at number one and the Maastricht Treaty came into force, formally establishing the European Union. And in that time the pub landscape has changed dramatically, with a recent report claiming that more 25% of UK pubs have closed since 2001. 1993 is also the year that we both graduated from Coventry Polytechnic and last weekend we joined a small group of fellow ex-students to revisit our old stomping grounds. We’ve both fleetingly called in on the city on separate occasions since (once each, over ten years ago) but this was our first chance to explore those old pubs together since gleefully handing back our graduation gowns to the hire shop. When we left we didn’t realise quite how many pubs we would be bidding farewell to for good. Among them biker’s basement haunt The Godiva; Spon End favourites The Malt Shovel and The Black Horse; the rickety old Shakespeare on Spon Street; Gosford Street pub crawl destinations including The Golden Cup* and Hand & Heart; and stop off point on the way home, The Admiral Codrington. But despite these boozer bereavements there still seemed more than enough pubs for city of Coventry’s size, with some of our old favourites still in business and a large range of new establishments open to tempt the current younger generation in from streets. The youth appeal of these flashier new bars meant that many of the student-packed pubs of 25 years ago were now populated by people of our own age, meaning we weren’t required to scrap our way to the bars with the younger and fitter folk. 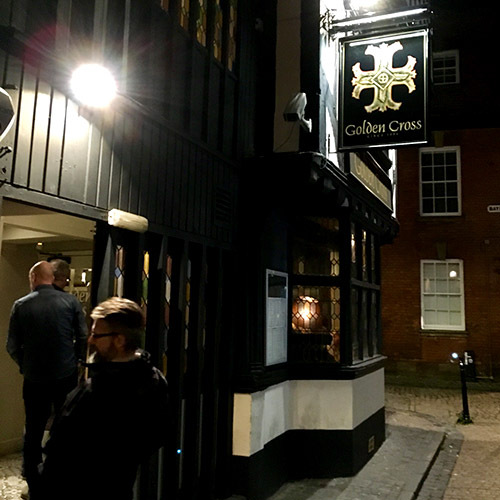 Having visited many pubs over the course of the weekend we’ve picked out five that we think make for a great city pub crawl for anyone with a weekend to fill in Coventry. Some things never change. This was our favourite pub in 1993 and our favourite in 2018. 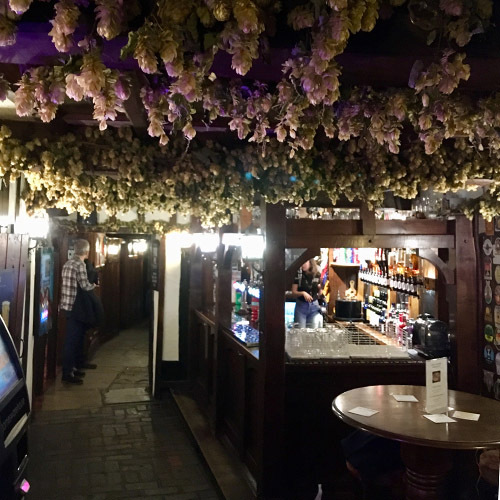 It’s believed to be Coventry’s oldest, a 15th century inn situated on medieval Spon Street, close to the city centre, with wonky walls, stone floors, exposed beams and various barrooms and snugs to relax in. It was always busy with a very mixed clientele enjoying fine cask ales and the occasional cider** and that still seems to be the case today. A proper old pub with a long history that, thankfully, is still run as a proper pub, rather than the kind of toursity, food-focussed, pub-museum that too many other ancient inns turn into. We drank: Having visited the Old Windmill three times during our Coventry reunion we managed to get through all seven of the cask ales behind the bar. Classics Timothy Taylor Landlord and Theakstone’s Old Peculiar were in excellent condition and hardly bettered all weekend, while we also enjoyed Slater’s light and hoppy ‘1 Hop’ (the single hop being Goldings). Another medieval pub that was built in the 16th century, becoming a public house in the 17th century, situated round the corner from the abby. The upstairs bar was our Friday night meeting place and it was always heaving and had a great atmosphere and Ruddles beers behind the bar. It looked a bit run down when we last saw it over ten years ago but has recently been given a tasteful makeover, with glass panels and Farrow & Ball colours complimenting the wooden timbers and stained glass windows. We drank: The upstairs bar had a much more limited selection than downstairs so we opted for the house beer, brewed by the Caledonian Brewery. It was decent enough but not quite up to the high cask standards set elsewhere. For some reason we don’t remember visiting this pub in the 1990s. Tucked around the corner from the Belgrave Theatre, Nick had a pint here on his only other trip to the city and made sure it was on the itinerary for this weekend. It’s an outstanding pub, perhaps second only the the Old Windmill, with a narrow room on one side of the bar, a more expansive lounge-ish room on the other and ‘The Donkey Box’ in the middle. This room has claims on being the tiniest in the country with its own bar and the Donkey Box regular occupying it shared a few tales about it while we were there (it was named after being visited by a pantomime donkey from the theatre). We drank: Lots more decent cask ales to choose from here including Goff’s Cheltenham Gold and Purity’s Mad Goose, both light and fruity, perfectly suiting the mid-afternoon part of our day-long session. 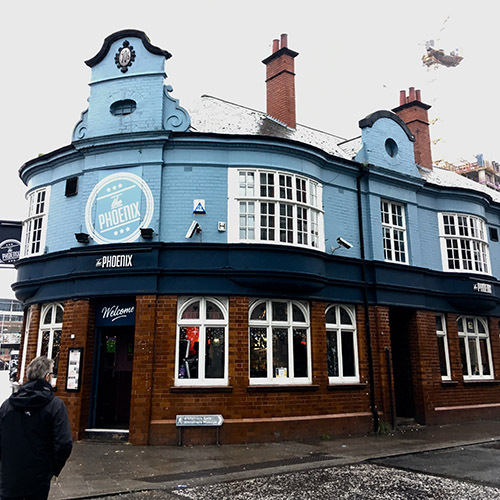 There are several other better Coventry pubs than The Phoenix, but it’s one we have a strong connection to and is the kind of place anyone can pop into at any time without feeling out of place. It was called the Sir Colin Campbell in our day (and the Parrot and Griffin long before then) and sat opposite our art college, beckoning us in for lunchtime halves and post-study sessions. It was also the kit sponsor of our football team. After we left it went through a chequered period, which included a major fire, before being reopened as The Phoenix – the symbol of Coventry University. Today it’s brightly lit with glitzy, modern pub ephemera and is full of TV screens, but it provided us with a relaxing distraction from the drizzle outside. 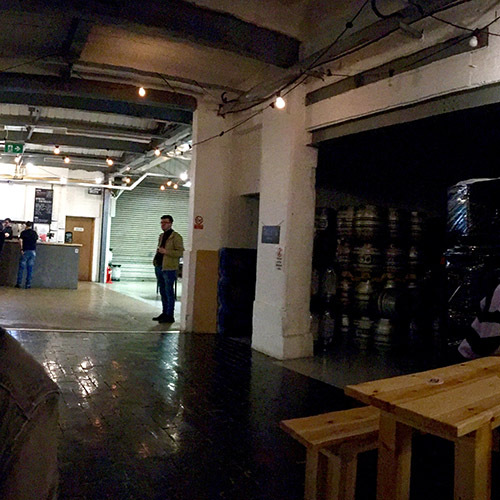 We drank: There were five keg and five casks on offer, mostly fairly mainstream. Nick played it safe with a Camden Helles while Rich was pleased with his choice of Robinson’s Trooper. Lucky Coventry. In our there were no breweries to head to for a fresh pint. Now Coventry doesn’t have just any run-of-the-mill brewery, but one of our favourite contemporary outfits, Twisted Barrel Ales. Just off Far Gosford street, which is now lined with ghosts of pubs, lies an assortment of modern food, drink, creative and community focussed businesses that is collectively known as Fargo Village (Far Gosford. FarGo. Got it?). Having moved from smaller premises opposite, Twisted Barrel occupy a good sized space, with piles of kegs separating tables and benches from the brewing equipment, and a bar with 20 keg taps. So impressed were we with this new addition to the city’s drinking scene that we trekked across the city for our final drinks on both nights. We drank: We got through quite a range of our hosts beers with the tang of Detroit City Sour hitting the spot as well as anything all weekend. From further afield we enjoyed the rare experience of drinking Weihenstephaner’s Helles on tap which was fresh as a just baked loaf, crisp and thirst quenching – not a bad way to finish off a weekend of beer adventuring. 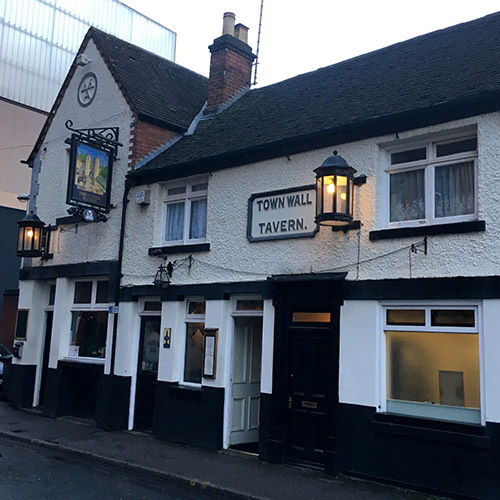 The post Coventry pub crawl: five best pubs 25 years on… appeared first on Two Thirsty Gardeners.